Buying one would be absurd; buying thirty is inspired. 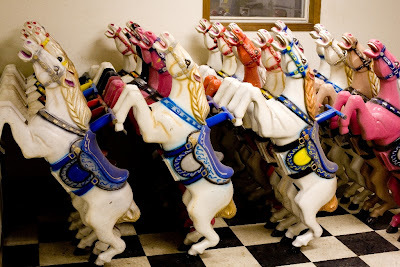 The Carousel International Amusement Company assets, real estate, intellectual property and the owner's pinball machine collection are being sold at auction on June 23rd. These are the moments that you reconsider moving to Pittsburg, CA and, instead, picture yourself as King of Kiddie Rides in Eldon, Missouri. "Situated in the Missouri Ozarks, Eldon is strategically situated directly between St. Louis and Kansas City - about 150 miles between each of them on the Midwest Corridor..."
Well, I am not a geography expert, but that sounds like the middle of Jackshit, Nowhere. One assumes that intellectual property includes the rights to the wormy apple kiddie ride. Kids LOVE to ride in a wormy apple, especially if your co-pilot is the worm. Is this a Richard Scarry character? 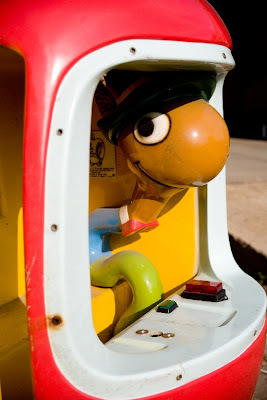 I wonder if I could just buy the Richard Scarry kiddie ride licensing agreement - making the bold assumption that it is licensed. Riding with the Lion in the Model T roadster pick-up truck - now that would be a kiddie ride.